Writing about ‘The Magician’s Apprentice’ and ‘The Witch’s Familiar,’ I’ve mostly just been saying “wow.” That’s perfectly appropriate: I found both episodes well made, strong examples of the form, excellent Doctor Who. But there’s so much good stuff in there that didn’t make my first impression. This is some of that stuff. Julian Bleach as Davros turns in a startling performance. Dying Davros is both tragic and horrifying, and his rejuvenation is as inevitable as it is terrible. We believed in him fully, whichever way he was playing. Missy is one hundred percent wonderful. Her interactions with the Doctor and Clara are a delight. Friendship; anachronisms; nemeses; gravity; her delivery on each topic is perfect. 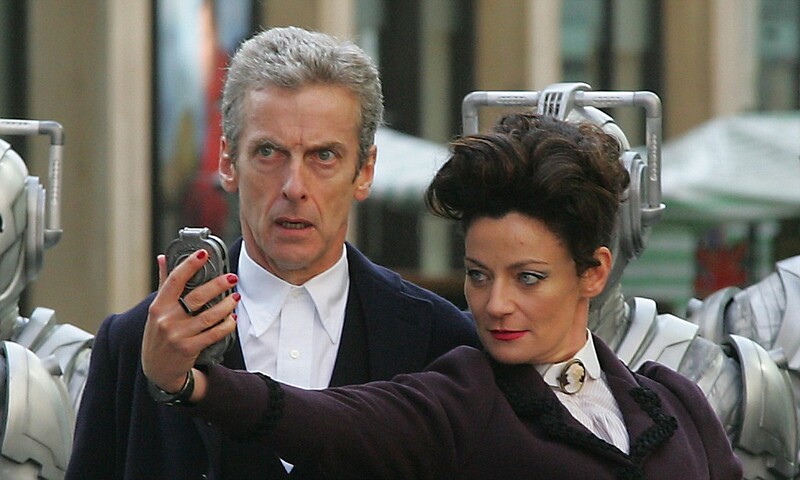 I want more Missy and more Michelle Gomez in everything. There’s something so right about Capaldi’s Doctor on the electric guitar. Capaldi has said it was something he mentioned he’d love to do, which Moffat then surprised him with, and that’s delightful in itself. But playing to an actor’s strengths and desires can really pay off. 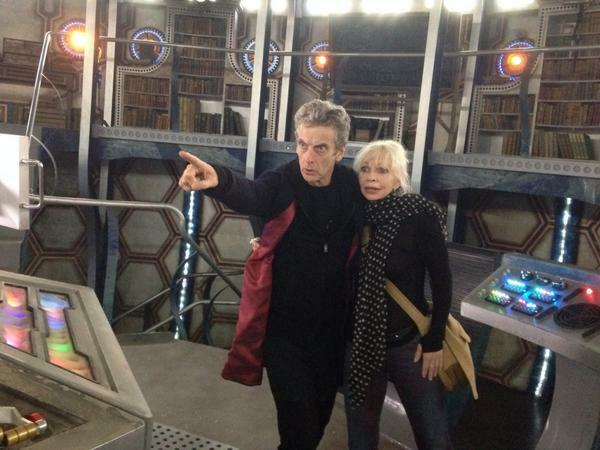 Capaldi’s Doctor puts heart into that solo – and those puns! – that few other Doctors could manage. The same could be said of his interactions with Davros. Capaldi knows Davros better than any prior Doctor. As a long-time fan, he has a depth to his relationship that few others reach. You can see their history in his face. And when Davros tells a joke – a joke!! – his surprise and pleasure are entirely real. In short, Capaldi makes it easy to forget he’s an actor in a role. He IS the Doctor in so many ways. Does Clara remember being Oswin Dalek? I doubt I’m the only one having ‘Asylum’ flashbacks. I wonder what the thinking was behind the scenes. I enjoyed the theme of friends and enemies as one, particularly relevant with Missy, but at least a little bit true in all relationships. The Doctor and Clara have betrayed one another before. The child Davros: That reveal knocked us out of our seats. 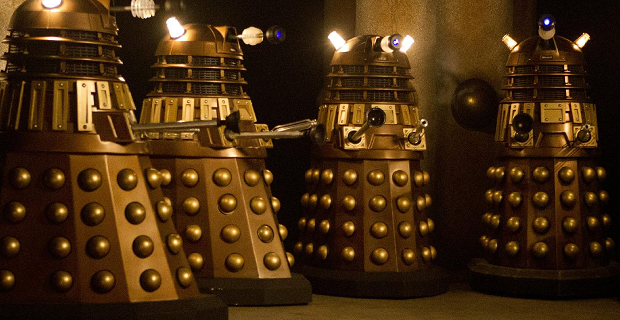 ‘Genesis of the Daleks,’ where the Doctor faces his greatest moral dilemma, remains a fan favorite even after 40 years. Its questions remain relevant. What Time Lord wouldn’t be tempted to avert the disaster that was Davros’ legacy? What human, given a time machine, wouldn’t consider murdering Hitler? And what would really result from those acts? The Doctor couldn’t live with himself as the man who abandoned a child in a war zone. Would the death of Hitler save six million Jews, or would some other calamity take his place? Would the universe truly be a better place less a single person? And whose decision is it to make? Surely there have been horrible humans before Hitler; why him and not them? And if them, how many? Where does it stop? Who gets to make that call? It’s hard to disagree with the Doctor. He saves people, even children who grow up to be murderers. By that act perhaps he instills sufficient mercy to save the life of one dear friend. By that act he saves himself: the man who could not live with that child’s blood on his hands. Of course this argument could go back and forth for days. As Clara said of Missy, is all the blood the Daleks shed now on the Doctor? Is he responsible for the evil he declined to prevent? It’s a favorite theme of the writers, to blame the Doctor for his enemies’ bad acts. But I respectfully disagree. Maybe the death of the child Davros prevents some of the chaos and destruction the Daleks sow. Maybe it doesn’t. Maybe someone else invents unstoppable little war machines. Maybe their warmaking destroys someone even worse. Maybe people die horribly for no reason all the time, and everything a time traveler tries to do to stop it can only exacerbate the evil. Taking fate into one’s own hands can hardly be a good thing, regardless of intentions. No good can come of a child’s death, no matter who that child is destined to become. Of course the Doctor takes on fate all the time. He interferes; he changes things. But maybe there are places where his changes are part of the fabric, and places where they aren’t. The fluid moments he speaks of, versus the fixed points. Maybe the Doctor isn’t a good man; maybe none of us are. But he tries to be, and I’m pretty sure that’s the point. I don’t know what happened to Steven Moffat. He hasn’t been this good in years. ‘The Witch’s Familiar’ is tight, fast-paced, compelling, sharply intelligent. Even knowing the final scene – not that it was spoiled, there was simply no other way for the prior final scene to resolve – even knowing that, we spent the whole episode on the edge of our seats. Julian Bleach as Davros had us one hundred percent convinced – and then not even remotely surprised. I am a bit confused about the titles. “Magician’s apprentice” is somewhat self-explanatory, and given the magician references in the last year, suggests Clara. A witch’s familiar is typically an animal, such as the perennial black cat; if we take Missy to be the witch, and keeping in mind Missy’s comment in E1 about who/what Clara is to the Doctor, then we might again consider Clara. But the episodes aren’t really about Clara. They are about the Doctor – not in the center-of-the-universe way that S5 and 6 were about the Doctor, but in a heart-of-the-story way, a close personal way: this is who the Doctor is, and this is a little of what made him. “I’m the Doctor,” he says in the S9 teaser. “I save people.” After last week’s ep, we were near certain that line came from this one. The man who understood himself enough to return, to instill mercy in the boy who would grow up to murder millions, because he saves people. He could do no other. This interview with Katy Manning is a few years old, but it’s every bit as delightful as she is. I may have mentioned before, Jo Grant is my favorite classic companion. In spite of her reputation as a scatterbrain, she was competent in her own way, courageous as anything, fiercely loyal, irrepressible, and generally a delight to be with. A quintessential companion, she was the perfect complement to Pertwee’s dashing Doctor, ready to give her life for him and his work without reservation. The actress herself is no less charming. I posted before about our enchanting encounter at Anglicon; when someone described her recently as “human sunshine,” I found it the comparison most apt. Nothing could bring Jo Grant down, and nothing stifles Katy Manning either. She returned briefly to the world of modern DW with Matt Smith and Elisabeth Sladen on The Sarah Jane Adventures. I’d love to see her on the show proper; I’m sure Peter Capaldi’s Doctor could show her an adventure worthy of Jo Grant. 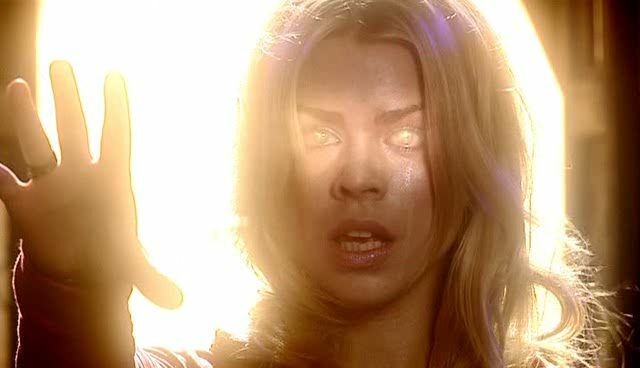 Ben and Polly witnessed the very first regeneration. Like the audience they represented, they watched in amazement as their old friend faded away, to be replaced by a dark-haired bohemian. Unfortunately the following episode is missing, so their response is lost to posterity. Sarah Jane Smith witnesses the Third Doctor’s transformation. Her friend the Brigadier has some idea of what to expect, having finally accepted that the Second and Third Doctors are in fact the same man. In addition, the Doctor’s associate K’anpo appears in his final moments to prepare her for what’s to come. Like Rose later, she is first baffled and then amused by her old friend’s new ways, and quickly grows close to him again. Also like Rose – and unlike any other classic companion – Sarah Jane is home and among friends when her Doctor fails her. She and UNIT do their best to face danger without him. And as he always does, the Doctor recovers just in time to step in and save the day – though not without significant help from Sarah Jane. Adric, Nyssa, and Tegan attend the Fourth Doctor’s passing. None of them has traveled with him for very long, and none has any idea what to expect. Nyssa and Tegan do their best to look after the baffled young man who appears in his place, but with Adric captured and the world where they land not quite what it seems, their difficulties only increase with each passing moment. Fortunately the Doctor recovers in time to rescue Adric and extract the TARDIS from the Master’s manufactured world, and the four travelers soon become fast friends. 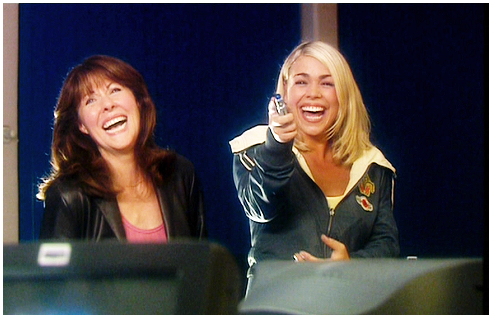 Peri has the worst time of it: only Six ever attempted to murder a companion while recovering from regeneration. Still, the two seem to more or less get over it, and continue to travel together for some time. I haven’t seen the episode, so I can’t say much about her response. Mel is present for her Doctor’s death, but unconscious, and the two are quickly separated. The Rani adds to the confusion with her disguise. When the two old friends finally meet, each thinks the other an imposter. But her single heart and his aversion to carrot juice soon set the record straight; once he explains his amnesia, the two get on with defeating the Rani. Mel claims to know something of regeneration, and has little trouble adapting once she’s sure the Doctor is the Doctor. 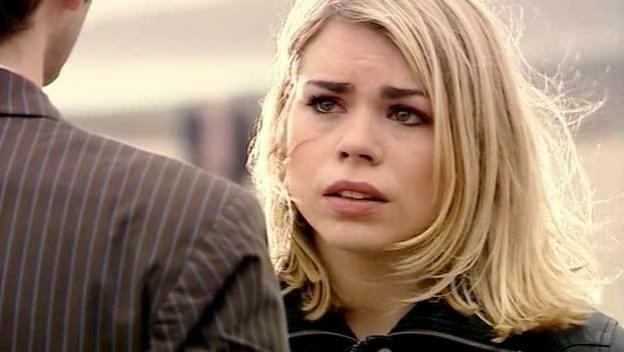 For Billie Piper’s birthday, the Radio Times counted down Rose’s best moments from her time on Doctor Who. As any regular reader knows, Rose is my gal: my #1 companion, the one I want most to be, the one I’d want along if I were the Doctor – one of my favorite fictional characters of all time. An ordinary person with an ordinary life, she found in herself courage, compassion, a drive to do the right thing, a zest for the opportunity of life in the TARDIS. At the same time, she’s a flawed, authentic human being, with petty jealousies, unkind words, selfish moments. Like the best of us she strives to overcome these things, and it’s her struggle that makes her real. Taking advantage of the Radio Times’ hard work, I’m going to comment on their entries one by one. At first blush this is not one of Rose’s better moments. The Doctor’s old companion puts her instantly on the defensive, and she skilfully shreds the older woman with her scorn. However, after a brief Mean Girls-style skirmish, Rose stops herself. She pushes her jealousy aside and opens herself up to friendship. Having more in common with one another than almost anyone else on Earth, the two women form a fast bond. The scene is a great example of Rose overcoming her faults, a model for us all to live up to. This isn’t really Rose Tyler, though the Moment finds her face in the Doctor’s timeline and recognizes her significance. It’s a wonderful opportunity for Billie to expand as an actor and have a little fun. It’s also an acknowledgement of Rose and Billie’s impact on the success of the show. So while not a Rose Tyler moment, it’s a great Moment, and I understand why they chose to include it. In the closing seconds of ‘The Stolen Earth,’ Rose and the Doctor finally find each other – only to be torn apart again by a Dalek blast. This is one of those overhyped, melodramatic moments that I normally despise, but because I love these characters so much, I wasn’t bothered. I also saw it coming eight miles away – but somehow, Tennant’s era is full of things I saw coming and loved anyway. Anticipation isn’t always a bad thing. I think Rose embodied most people’s first reaction to Captain Jack in this scene. Flirting is such an ingrained part of the show now, but here it’s still new and fresh: an interested woman and an interested man having a bit of safe, consensual fun. I kind of miss the relative innocence of their interaction; no one since has had John Barrowman’s charm. This one is an absolute winner. She begins with a mistake, she defends her decision, she brushes off the Doctor’s rage. Then, as she realizes the impact of what she’s done, she experiences all the horror and remorse that go with that. Most of us won’t endanger the universe with our errors, but everyone knows the pain of unintended consequences. On the plus side, she gets to know her dad, and to see him as the hero she always believed he could be. Rose matures a lot in this story, and takes her relationships – with herself, her family, the Doctor – to a new level. In ‘The Parting of the Ways,’ the Doctor sends his friend home for her own safety. However, she’s no longer willing to stay home safe while he gives his life for her people. She makes a stand; she says no. She has the guts to do what’s right when everyone else just runs away. Even when she doesn’t know what to do. This episode showcases Rose’s compassion like no other. The Doctor sees only a killing machine: Rose sees a creature in pain, that only wants a chance to feel the sunlight. Here, Rose’s courage takes center stage. The Doctor lies sleeping, out of reach. The Earth is under attack. Her home, her family, everything she knows is in danger. She wants to hide – she tries to hide – but when circumstances require a hero, she steps up. She overcomes her fear and acts anyway. She doesn’t know what to do, she knows she’ll probably be killed, and she doesn’t let it stop her. As the Doctor says later, “Everything she did was so human.” Gaining godlike powers from the Vortex, she uses them to save her friends and the Earth below, with no thought for her own safety. Rose’s first goodbye is everyone’s favorite moment. It’s melodrama, but decently executed, and the acting is beyond compare. (A later reviewer of a stage play of Billie’s commented that “no one can cry more convincingly” than she can.) 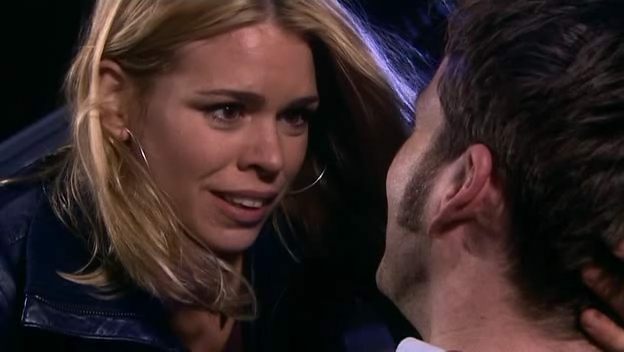 I wouldn’t have ranked it #1 – I’d give that spot to ‘Father’s Day’ or ‘Dalek’ – but for Rose Tyler, it’s a pretty definitive scene. I can understand why the Radio Times left this one out, as it’s more the Doctor’s moment than Rose’s. However, it so beautifully embodies who she is – for him and for herself – that the list feels incomplete without it. Happy Birthday, Billie Piper, and thank you for Rose Tyler. The Doctor isn’t human. He doesn’t think human; he doesn’t act human. He often appears human, and he’s spent enough time among us to pick up a few of our ways, but the fact remains that he isn’t one of us. Matt Smith forgot this; his Doctor was a flirt and a player. The Tenth Doctor’s fangirls forgot too: his charm made his alienness easy to ignore. It’s interesting how hyper-aware Moffat seems of his fans. People adored the romance of the Tenth Doctor’s era, and Moffat cranked it up to eleven. People wearied of Eleven’s libidinous ways, and Moffat retracted them most vehemently. It’s fascinating to watch ideas leap from Tumblr to canon and back again, fast enough to leave you dizzy sometimes. It’s television for the 21st century, where artist and audience give and take like co-creators. Time will tell if it’s a good thing. Also, Michelle Gomez is magic. I adore her.